Homeopathy is a healing art based on the principle that "like cures like." Homeopathic practitioners prescribe extremely diluted remedies -- based on the patient’s condition -- that would provoke the same symptoms in healthy patients. Based on homeopathy's principles, these same substances remove an unhealthy patient's symptoms. Accordingly, mistaken diagnosis can result in negative side effects. Western medical science has given little support for homeopathy, as many remedies are so highly diluted that they may contain no molecules of the potent ingredient. Consult your primary health-care provider before seeking treatment. According to homeopathy's principle of "like cures like," taking the wrong type of remedy may result in new, undesirable symptoms. As homeopathy works holistically, taking a broad view of any individual's condition, homeopathic practitioners must familiarize themselves thoroughly with each patient before recommending a remedy. Two individuals with similar conditions might require different remedies. Factors that affect prescription include health history, body type, emotional tendencies, mental symptoms and specific details of recent symptoms. If you seek homeopathic treatment, consult a qualified professional. Even if you receive the correct homeopathic remedy for your condition, you may experience a worsening of effects before you see improvements. Many homeopathic practitioners refer to this as "homeopathic aggravation," a typical dip in the healing process. According to the National Center for Alternative and Complementary Medicine, the few scientific studies on this aspect of homeopathy have not found regular evidence of aggravation. The University of Maryland Medical Center states that many individuals report an initial worsening of symptoms after taking a remedy. 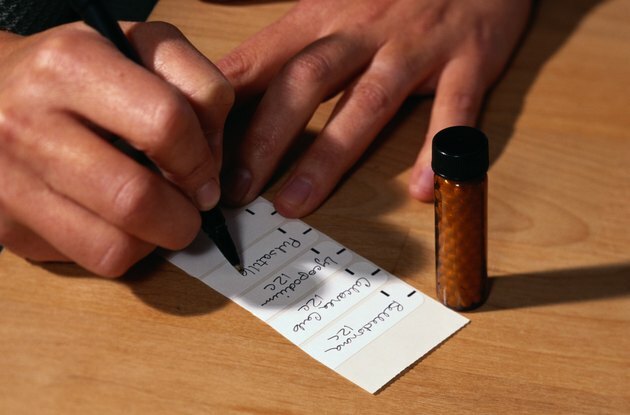 The extremely diluted nature of homeopathic remedies removes risk of ultimately negative side effects, suggests the University of Maryland Medical Center. One common remedy, arnica, can cause serious side effects if taken internally in large doses. For instance, the herb may irritate the stomach and may cause vomiting, diarrhea and nosebleeds, according to the American Cancer Society. However, when used in homeopathy, the herb is extremely diluted, purportedly removing the risk of side effects. No studies, as of publication, have shown negative side effects of combining a homeopathic treatment with conventional medicines. Still, inform both your doctor and your homeopathy practitioner of remedies you plan to take concurrently. As the University of Maryland Medical Center reports, homeopathic treatments have undergone limited clinical studies, largely because of the difficulty of producing repeatable effects with such a holistic and personalized treatment. However, preliminary findings confirm homeopathy's helpfulness for a range of conditions: from allergies to cold and flu to asthma and diarrhea. When you have a serious condition like cancer, consult with multiple medical specialists before selecting a treatment. In the United States, homeopathic practitioners needn't receive nationwide licensure, though many states require some form of licensing. Many homeopathic practitioners are also medical doctors or hold a degree in another medical field. Can You Drink Different Herbal Teas in a Day?